A team of soldiers confronts nightmarish visions when they become trapped inside an abandoned tank. Fleeing from unseen enemies, a squad of mercenaries escorting two hooded POWs retreats to an abandoned farm. The squad consists of commanding officer Smith, experienced rifleman Gantz, cowardly scout Evans, rookie Reeves, female medic Karlsson, and Capper, who is wounded with a broken leg. After inspecting a barn full of decapitated soldiers, Gantz and Reeves find a dazed young woman living inside a locked cargo container. Smith orders the men to bring the woman with them. Evans envisions a masked man on the horizon and begins firing. Smith orders the team to escape the farm, although they are forced to leave Capper behind. Evans runs off alone. As everyone trudges across an open field, Gantz sees the masked man and begins firing. A hostage stabs Gantz and tries escaping in the commotion. Reeves is forced to shoot her. Smith, Karlsson, Gantz, and Reeves collect the rescued woman and remaining prisoner, named Annabella, and enter an abandoned tank nearby for safety. The tank door becomes jammed, locking everyone inside. Assuming it is a sedative, Karlsson continues injecting an orange substance to keep people calm and to treat injuries. While looking for a toolkit to repair the tank engine, the group discovers canisters of an orange substance labeled ‘Kratos.’ Annabella explains that Kratos is Greek for strength and power. Over the course of their confinement, everyone suffers from various visions and paranoia. Smith continually writes in a notebook, which maddens the others. Gantz repeatedly sees the masked man outside and refuses to do further work in the tank’s front compartment. Reeves has nightmares of medical needles and experiences premonitions of upcoming events. Annabella tries convincing Reeves that something isn’t right about their situation, explaining that she doesn’t remember anything and does not understand why she is a prisoner. While searching the tank, Karlsson uncovers medical files for every single one of them, including Annabella and the rescued woman. She realizes they are all test subjects in an unknown experiment. The files also indicate that they are deceased. Working to repair the engine up front, Reeves finds dog tags indicating that the previous driver’s corpse belongs to Evans, although Reeves does not understand how that is possible. Capper arrives at the tank on foot, uninjured and carrying the executed hostage’s decapitated head. Capper taunts Reeves and Smith from outside and refuses to open the door. Capper also asks Karlsson if she has figured out what she has been injecting into everyone. Smith refuses to reveal what he knows about the experiment. Annabella shoots and kills Smith with a flare gun. Gantz also dies. Karlsson and Annabella shoot each other. Before dying, Karlsson recovers Smith’s notebook and discovers he was recording dosages for the substance Karlsson was administering. Reeves finally starts the tank and runs over Capper. The tank eventually stops. Realizing the door now opens, the rescued woman exits the tank and walks away. A research team arrives at the tank and notes that their experiment was successful. Seeing that Reeves survived and is still inside, the team sets the tank on fire. A voice over battlefield loudspeakers directs staff to their workstations, announcing that an experiment is about to begin. A confused soldier emerges from a hatch in the forest floor and begins running. Ever since a thoroughly nonplussed experience with “A Field in England” (review here), I approach Ben Wheatley projects like landmines poised to explode in a confusing cloud of impenetrable abstractness. Love it, hate it, or have only indifference, if you’re familiar with Ben Wheatley’s work, you know what I’m talking about. “Tank 432,” which originally premiered in 2015 under the title “Belly of the Bulldog,” is only executive produced by Wheatley. But Nick Gillespie, the British filmmaker not the American journalist, has spent enough time on Wheatley sets in camera crew capacities that his style is sold as being in a similar vein. Thus, I hemmed and hawed for some time before pressing play on Gillespie’s directorial feature debut, worried of willfully walking into a 90-minute snoozer of cryptic vagaries I might not be able to decode. Part of my hesitation came courtesy of predominantly unenthusiastic criticism that seemingly affirmed presuppositions. Four of five Rotten Tomatoes reviews use phrases including “slow-moving, confusing obscurity, unsettling ambiguity,” and more than one insertion of “tedious” to describe “Tank 432.” All of these are akin to adjectives I’ve used in conversations regarding Ben Wheatley’s films. Color me surprised then to discover “Tank 432” is neither as drab nor as incoherent as the above leads one to believe. Oh, the film is certainly as obtuse as I feared and as consumed with its own cinematic presentation as I expected. Gillespie is absolutely influenced by the indie artist urge to elevate showy pomp over grounded circumstance. Yet the narrative underneath can be discerned with minimal difficulty, even if metaphoric meaning disappears before its presence is ever announced. And the environmental eeriness is too engaging on a hypnotically arresting level to dismiss the film as dull. In an unspecified battlefield amid an unknown conflict, soldiers created from the convenience of easily distinguishable characteristics, or from clichés if you’re cynical, flee from an unseen enemy with two hooded prisoners in tow. Smith is the barking CO. Gantz is the battle-hardened vet. Evans is the lanky coward. Reeves is the idealistic rookie. Karlsson is the female medic. You get the picture. A masked man on the horizon, who may or may not be a figment of certain imaginations, draws fire from the crew. Two men are left behind and one prisoner doesn’t make it, but the team adds a disoriented woman found locked in a cargo container to their ranks along the way. Shelter from the invisible threat is then sought in an abandoned tank nearby. But once they are inside, everyone discovers a jammed hatch means they have no hope of getting out. Over the course of their captivity, the crew suffers from haunting nightmares, paranoid premonitions, and cabin fever that comes from confinement. Answers and explanations for what is happening and why are in short supply. Cerebral episodes of dreamy delirium however, are plentiful. And “Tank 432” fashions its back half entirely from this hearty stockpile of visualized insanity. The movie does not develop quickly. What does develop is undoubtedly an acquired taste suited for palates tolerant of artistically alienating material. Shots are purposeful, even if those purposes are not in plain sight. Gillespie’s career behind the camera gives him the intuition to fabricate imagery that is essential for establishing distinct feelings. Accomplished acting then reacts to those setups in ways that allow audiences to echo a mindset of maddening tension without being required to connect to or care for any of the characters. “Tank 432” is hollow in that sense. Yet the ghostly interior is able to affect imaginations through unsettling sights, sounds, and performances. “Tank 432” has a story, even though it isn’t delivered tangibly. It’s layered underneath atmosphere. The movie is more of an experiment in claustrophobic uncertainty intended to be consumed as a parallel experience with the people onscreen, not like the passively fed fiction of a linear book or other form of traditional entertainment. It’s an interesting film to look at it. It’s an interesting film to feel. I’m generally a hard sell for movies that prioritize mood over meaning. A number of neophyte filmmakers finding their footing in psychological cinema thoughtlessly throw interpretive aesthetics at a wall, label it Lynchian, and assume academic applause for being a supposed visionary is incoming. I don’t believe that is what Nick Gillespie has done here. 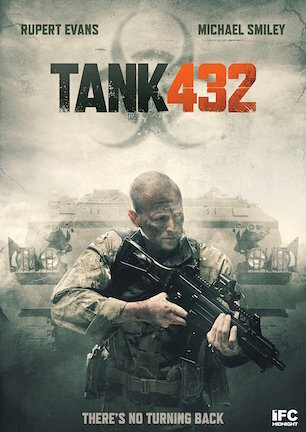 There is much more rhyme and reason to the hallucinatory hellishness of “Tank 432” than many critics give it credit for. April 28, 2017 by Ian Sedensky.